A protocol for a fixed-fixed beam design using a laser Doppler vibrometer (LDV), including the measurement of frequency tuning, modification of tuning capability, and avoidance of device failure and stiction, is presented. The superiority of the LDV method over the network analyzer is demonstrated due to its higher mode capability. Goktas, H. Design and Characterization Methodology for Efficient Wide Range Tunable MEMS Filters. J. Vis. Exp. (132), e56371, doi:10.3791/56371 (2018). Here, we demonstrate the advantages of the laser Doppler vibrometer (LDV) over conventional techniques (the network analyzer), as well as the techniques to create an application-based microelectromechanical systems (MEMS) filter and how to use it efficiently (i.e., tuning the tuning-capability and avoiding both failure and stiction). LDV enables crucial measurements that are impossible with the network analyzer, such as higher mode detection (highly sensitive biosensor application) and resonance measurement for very small devices (fast prototyping). Accordingly, LDV was used to characterize the frequency tuning range and resonance frequency at different modes of the MEMS filters built for this study. This wide range frequency tuning mechanism is based simply on Joule heating from the embedded heaters and relatively high thermal stress with respect to the temperature of a fixed-fixed beam. However, we demonstrate that another limitation of this method is the resulting high thermal stress, which can burn the devices. Further improvement was achieved and shown for the first time in this study, such that the tuning capability was increased by 32% through an increase in the applied DC bias voltage (25 V to 35 V) between the two adjacent beams. This important finding eliminates the need for the extra Joule heating at the wider frequency tuning range. Another possible failure is through stiction and requirement of structure optimization: We propose a simple and easy technique of low frequency square wave signal application that can successfully separate the beams and eliminates the need for the more sophisticated and complicated methods given in the literature. The above findings necessitate a design methodology, and so we also provide an application-based design. There is a growing demand for MEMS filters due to their high reliability, low power consumption, compact design, high quality factor, and low cost. They are widely used as sensors and as core parts in wireless communication. Temperature sensors1, bio-sensors2,3, gas-sensors4, filters5,6,7, and oscillators are the most popular application areas. The most popular electrostatic MEMS filters are fixed-fixed beam5,8, cantilever2, tuning fork6, free-free beam6,7, flexural-disk design7, and square shape design9. There are many critical steps in realizing a MEMS filter, such as design methodology (application-based structure optimization, wide range frequency tuning range, and avoiding failures) and characterization (fast prototyping, avoiding parasitic capacitances, and detecting higher modes). Frequency tuning capability is required to compensate for any frequency changes due to fabrication tolerances, or ambient temperature variations. Different techniques10,11,12 have been reported in the literature to address this requirement; however, they have some drawbacks such as limited frequency tuning capability, low center frequency, additional post processing requirements, and external heater10,11. In this study we present wide range frequency tuning by the Joule heating method5,13 over a limited frequency tuning range via an elastic modulus change12 (increasing the DC bias voltage between two adjacent beams) and a material phase transition method10,11. Moreover, the optimum structure selection and the application-based design were summarized in Göktaş and Zaghloul13. Here, we show how to tune the resonance frequency of a fixed-fixed beam by increasing the DC voltage applied to the embedded heater with the help of the LDV. The finite element analysis (FEM) simulation is synchronized with the LDV measurement in the same frame for the sake of visualizing the tuning mechanism. This includes the Joule heating and bending profile throughout the beam. We also present the possible failures (burnt devices and stiction) and their proposed solutions. The Joule heating method in combination with the high thermal stress of the fixed-fixed beam provides wide range frequency tuning but at the same time can result in burnt devices at a certain temperature level. This is attributed to the high thermal stress between different materials14. The solution is to increase the DC voltage between the two adjacent beams, which in turn increases the tuning range (by 32%), and eliminates the need for high temperature. This "tuning the tuning-range" method was first demonstrated in Göktaş and Zaghloul5, explained in more detail in Göktaş and Zaghloul13, and re-presented here. Stiction, on the other hand, can take place during the fabrication process or resonance operation. There have been many techniques proposed to address this problem such as applying surface coating to reduce adhesion energy15,16, increasing surface roughness17, and the laser repair process18. In contrast, we present a simple technique where a low frequency square wave signal was applied between two attached beams and the separation was successfully recorded by LDV. This method can eliminate extra cost and reduce design complexity. Another critical step in building a state of the art MEMS filter is characterization and verification. Characterization with a network analyzer is one of the most popular and widely used methods; however, it has some drawbacks. Even small parasitic capacitance can kill the signal and so this usually requires an amplifier circuit3,6,8 for noise elimination, and it can only detect first mode resonance. On the other hand, characterization with LDV is free from this parasitic capacitance issue, and can detect much smaller displacement. This enables fast prototyping, while eliminating the need for amplifier design. Furthermore, LDV can detect higher mode resonance of MEMS filters. This feature is very promising, especially in the field of highly sensitive biosensors. A higher cantilever mode can provide much more sensitivity19. The higher mode measurement of a fixed-fixed beam with LDV is shown and applied to FEM simulation measurement. The premature results from the FEM simulation offer up to 46 times improvement in sensitivity compared to the first mode of the fixed-fixed beam. Select the fixed-fixed beam for wide range frequency tuning (compared to other candidates, it enables wide range tuning when it is heated due to its large temperature coefficient of frequency (TCF) and negligible thermal expansion constant). Design a longer beam if the purpose is tuning efficiency improvement. Design a shorter beam if the purpose is frequency hopping or signal tracking applications. Design and create the 3D-model for the MEMS filter in a FEM-based program. Reconstruct the same layout in an integrated circuit (IC) design tool, layer by layer to create the gds file. Submit this gds file to the CMOS foundry for fabrication (we used CMOS 0.6 µm technology). Continue with post-processing once the CMOS process is completed (note that the chips should have polysilicon, aluminum, and oxide layers). Conduct the CHF3/O2 dry etch process via an inductively coupled plasma (ICP) etch system. Etch the SiO2 between aluminum layers and form the beams at the aspect ratio of 5.7. For this process, use the following parameters: CHF3 at 40 sccm, O2 at 5 sccm, pressure at 0.5 Pa, ICP power at 500 W, and sample power at 100 W with the 56 min total etch time. Apply the XeF2 etch process in the silicon substrate to create a 9 µm depth cavity under the beams. For this process, use the XeF2 etching system for 3 cycles at 3T, for 60 s/cycle. Characterize the devices with a scanning electron microscope (SEM) to ensure they are properly fabricated. For this step, change the beam accelerating voltage to 2.58 kV and the working distance to 9.5 mm. Note: Device testing consist of many steps including the Joule heating test and frequency response test. Position the thermal camera on top of the chip and test the embedded heaters to ensure they heat the beams. Connect the power supply to the chip package and apply a DC voltage on the embedded heaters from 0 V to 5.7 V in small increments to increase the temperature throughout the beams. Record the temperature profile throughout the chip package via a thermal camera during the heating process. Save the results in a numerical computing program and plot the heating profile. Position the laser on top of the 120 µm long beams. Connect the power supply between the two 120 µm long beams to apply both 7 V DC and 3 V AC voltage for the resonance operation. Connect an additional DC bias voltage to the embedded heaters with a maximum of 5.7 V to apply Joule heating to the beams during the resonance operation. Move the laser to a different spot on the beam to get a low noise laser reflection. Make sure to increase the intensity of the blue bar to decrease the noise. Divide the screen into multiple views to calibrate and start the measurement setup. Go to Acquisition Settings, set the measurement mode to FFT, do not use any filter, and set the bandwidth to 2 MHz. Change the velocity so that it can support a maximum frequency of 2.5 MHz. Use the periodic chirp waveform. NOTE: Here, Amplitude stands for AC voltage and Offset stands for DC voltage. Start the measurement with this new setup. Update the Acquisition Settings by changing the DC voltage to 1 V.
Decrease the applied bias voltage in the Acquisition Settings window when the Ref1 shows the red alarm (this means that the signal is noisy). Move the laser to a different spot on the beam to further increase the signal-to-noise ratio. Occasionally, there may be bad spots on the beam that causes the red alarm on the vibration bar; in this case, continue to search for the best spot. Select the 68 µm long MEMS filter for testing. Apply 25 V DC voltage and 5 V AC voltage together between the two 68 µm long adjacent beams. Here, the DC voltage provides bending and the AC voltage enables the resonance operation. Apply an additional DC voltage to the embedded heaters placed in the 68 µm long beam, and increase the voltage from 0 V to 5.7 V in small increments. This will provide frequency tuning based on the Joule heating. Observe and record the resonance frequency and phase response with respect to the applied bias voltage at each step and summarize the results in a table. Here, the total frequency tuning for this sample is around 874 kHz when the 5.7 V DC voltage is applied to the embedded heater. NOTE: Simulations (on the right side) and real measurement (on the lefts side) are synchronized. Push the A/D button to go to the Acquisition Settings window demonstrated in Section 3.2 and change the velocity so that it can support very high frequencies. Measure the first and the second mode with their phase. NOTE: The primary resonance displacement is in Y direction for mode-1 and it is in Z direction (that is towards the microscope) for mode-2. Apply a 1 Hz square wave signal to solve the stiction problem that results from electrostatic charging between the two adjacent beams. Go to the offset box and set the DC voltage to 1 V, while keeping the AC voltage at 1 V.
Go to the frequency box and set the frequency to 1 Hz. Activate and apply this new setup on the beams. Observe the separation of the beams. Use an extra sample for the thermal stress test. Increase the applied bias voltage on the embedded heater by small increments to find the maximum allowable voltage before the device fails due to high thermal stress. Apply a 25 V DC voltage and 5 V AC Voltage together between the two 68 µm adjacent beams while increasing the applied bias voltage on the embedded heater from 0 V to 5.7 V, for a total 661 kHz frequency shift. Increase the applied bias voltage from 25 V to 35 V to add an additional spring softening effect between the two 68 µm long adjacent beams, while applying a 1 V AC voltage and keeping the same bias voltage setup on the embedded heaters. Record the 32% improvement in total frequency shift as it should increase from 661 kHz to 875 kHz coming from this additional spring softening effect. NOTE: To the best of our knowledge, changing the tuning capability of the MEMS resonators was achieved for the first time in this work. Stiction was avoided by applying low frequency square wave signal and this was verified by using LDV (Figure 1). Possible failure due to high thermal stress14 when applying relatively higher bias DC voltage to the embedded heaters was verified under microscope (Figure 2). The FEM program was used to derive the higher modes for the beam (Figure 3). Changing the tuning capability (32% increase) by changing the DC bias voltage (25 V to 35 V) between the two adjacent beams was demonstrated for the first time in this work5 with the help of the LDV (Figure 4). The capability of measuring higher mode responses via the LDV was demonstrated successfully and the results were compared with the FEM simulation. The 5th mode was measured with the LDV by measuring multiple points on each beam. The measured mode shape perfectly matched with the FEM simulation (Figure 5). Moreover, up to 46 times improvement in frequency shift with respect to the first mode was demonstrated by the FEM when a 1 pg mass was attached to the MEMS filter. This promising result would provide a much more sensitive biosensor when combined with the higher mode reading capability of the LDV (Figure 6). Figure 1: Stiction between the MEMS filters. Stiction took place at T = 55 s, with the beams being released at T = 57 s after applying the low frequency square wave signal. Please click here to view a larger version of this figure. Figure 2: Burning throughout the MEMS filters. (a) 200 µm long MEMS filters before applying the high DC voltage to the embedded heaters (b) 200 µm long MEMS filters after applying the high DC voltage to the embedded heaters (c) 240 µm long MEMS filters after applying the high DC voltage to the embedded heaters. Please click here to view a larger version of this figure. Figure 3: Mode shapes. Beam at higher modes (Mode-1 to Mode-9) Please click here to view a larger version of this figure. Figure 4: Tuning the tuning capability. Frequency response as a function of different applied bias voltages on the embedded heaters of the 68 µm long MEMS filters (a) when Vdc = 25 V and Vac = 5 V, and (b) when Vdc = 35 V and Vac = 1 V. Please click here to view a larger version of this figure. Figure 5: High mode measurement. (a) The measured high mode response for L = 152 µm long MEMS filters. 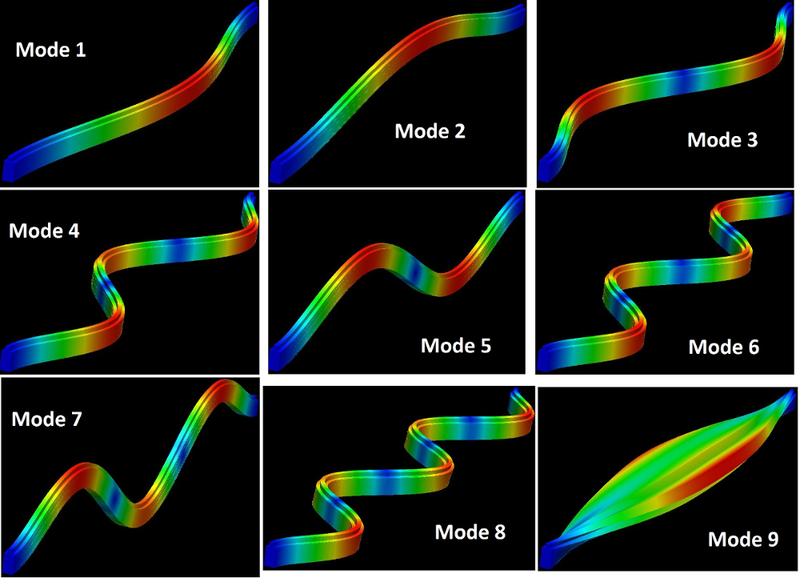 (b) The FEM simulation results with the same mode shape. (c) The measured higher mode responses for L = 152 µm long MEMS filters at different frequencies. Please click here to view a larger version of this figure. 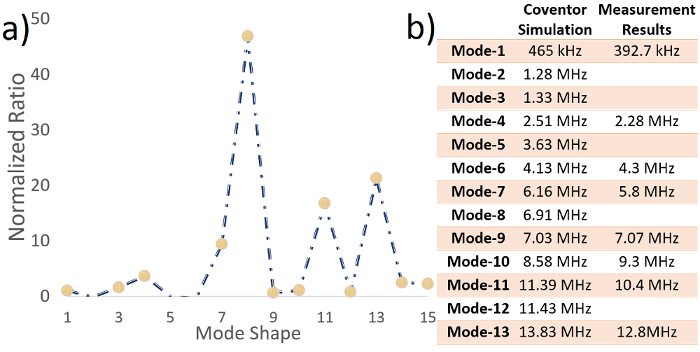 Figure 6: Different modes and their expected performances. (a) The normalized frequency shift with respect to first mode with 1 pg mass attached to the MEMS filter. (b) Comparison between measurement and Coventor simulation for higher mode responses of 152 µm long MEMS filter. Please click here to view a larger version of this figure. One of the critical steps in building MEMS filters is to design the device based on the application area. The beam should be longer or thinner for better tuning efficiency (ppm/mW), but shorter or thinner for frequency hopping or signal tracking applications. In the same way, clear signal detection via LDV is critical in device testing which is why it is better to design the beam with at least 3-4 µm thickness. Otherwise the signal will be noisy, even with a 100X lens, and it takes multiple points testing with noise elimination (embedded in LDV software) to achieve optimum detection. Due to its large TCF, the fixed-fixed beam, compared to other candidates (cantilever, tuning fork, and free-free beam), enables wide range frequency tuning when it is heated. In this study we used the Joule heating method with polysilicon layers as the embedded heaters. Stiction can take place during the resonance operation due to electrostatic charging. Many different methods have been presented in the literature, such as designing the beam with high stiffness constant, coating the surface with anti-stiction chemistry, and applying high DC voltage in the reverse direction. In contrast, for the purpose of troubleshooting, we present an alternative, easy technique here. By applying a relatively high voltage low frequency (1 Hz) square wave signal for a short time (Figure 1), the beams can separate from each other and continue to resonate. This solution enables a low-cost design and eliminates the more complex solutions such as anti-stiction coating. Relatively high density current flowing throughout the fixed-fixed beams due to higher voltage application can cause device failure (broken or burnt devices) (Figure 2). This is mainly due to mismatch in thermal expansion constants of different layers in the fixed-fixed beam13,14. To avoid failure, the maximum allowable voltage for each different fixed-fixed beam should be studied and defined carefully, together with the maximum frequency tuning range. The maximum allowable voltage and power consumption varies from beam to beam and depends on the device dimensions13. The maximum allowable voltage applied to the embedded heaters for the 68 µm long beam in this work is between 6.3-7 V before device failure. One of the biggest challenges of the network analyzer method is to eliminate parasitic capacitances. The IC design tool is used to plot the frequency and phase response of the equivalent circuit for the 120 µm long MEMS filters. The S21 peak to peak value drastically decreased from 6 dB to 0.34 dB even when the parasitic capacitance increased from 1 fF to 20 fF, necessitating an on-chip amplifier design positioned next to the MEMS filters6,8. In contrast to the network analyzer, LDV offers many advantages in resonance measurement of the fixed-fixed beams. First of all, it eliminates the parasitic capacitance and this enables fast prototyping and much smaller device (high frequency devices) characterization. Moreover, the LDV offers higher mode characterization (Figure 3) while the network analyzer is limited to characterizing the first mode only. This provides many advantages in different research areas such as biosensor applications19. To the best of our knowledge, tuning the tuning-capability was demonstrated for the first time in this work5. The additional spring softening effect due to an increase in the applied DC bias voltage between the two adjacent beams provides a 32% increase in the total frequency tuning range. Increasing the applied DC voltage between the two adjacent beams adds additional spring softening on top of the softening from the Joule heating, and this results in a wider frequency tuning range. The tuning range increases from 661 kHz to 875 kHz when the DC voltage between the two adjacent beams increases from 25 V to 35 V (Figure 4). This feature is in great demand in applications such as frequency hopping, signal tracking, and reconfigurable receiver and transceiver circuits. The MEMS filters have been drawing tremendous attention especially for portable biosensor applications2,3,20. The FEM is used to study the higher mode responses. According to early results, the higher modes can provide much better sensitivity (up to 46 times improvement compared to first mode) (Figure 6), a highly valuable and sought-after characteristic in the portable biosensor field. For this reason, the uptake of the LDV technique presented here is considered inevitable. Measuring the resonance of devices at higher modes will require LDV involvement due to its capability of higher mode detection (Figure 5). This impressive capability of the LDV, together with the possibility of higher sensitivity at higher modes, may lead to state of the art biosensors with high sensitivity. This work was supported by the U.S. Army Research Laboratory, Adelphi, MD, USA, under Grant W91ZLK-12-P-0447. The resonance measurements were conducted with the help of Michael Stone and Anthony Brock. The thermal camera measurement was conducted with the help of Damon Conover from the George Washington University. Göktaş, H., Turner, K., Zaghloul, M. Enhancement in CMOS-MEMS Resonator for High Sensitive Temperature Sensing. IEEE Sensors J. 17, (3), 598-603 (2017). Davila, A. P., Jang, J., Gupta, A. K., Walter, T., Aronson, A., Bashir, R. Microresonator mass sensors for detection of Bacillus anthracis Sterne spores in air and water. Biosens. Bioelectron. 22, (12), 3028-3035 (2007). Lee, J., et al. Suspended microchannel resonators with piezoresistive sensors. Lab Chip. 11, (4), 645-651 (2011). Arash, H., Pourkamali, S. Fabrication and Characterization of MEMS-Based Resonant Organic Gas Sensors. IEEE Sensors J. 12, (6), 1958-1964 (2012). Göktaş, H., Zaghloul, M. Tuning In-Plane Fixed-Fixed Beam Resonators with Embedded Heater in CMOS Technology. IEEE Electron Device Lett. 36, (2), 189-191 (2015). Li, C. S., Hou, L. J., Li, S. S. Advanced CMOS-MEMS Resonator Platform. IEEE Electron Device Lett. 33, (2), 272-274 (2012). Li, M. H., Chen, W. C., Li, S. S. Mechanically Coupled CMOS-MEMS Free-Free Beam Resonator Arrays With Ehanced Power Handling Capability. IEEE Trans. Ultrason. Ferroelect. Freq. Control. 59, (3), 346-357 (2012). Lopez, J. L., et al. A CMOS-MEMS RF-Tunable Bandpass Filter Based on Two High-Q 22-MHz Polysilicon Clamped-Clamped Beam Resonators. IEEE Electron Device Lett. 30, (7), 718-720 (2009). Khine, L., Palaniapan, M. High-Q bulk-mode SOI square resonator with straight-beam anchors. J. Micromech. Microeng. 19, (1), (2009). Manca, N., et al. Programmable mechanical resonances in MEMS by localized joule heating of phase change materials. Adv. Mater. 25, (44), 6430-6435 (2013). Rúa, A., et al. Phase transition behavior in microcantilevers coated with M1-phase VO2 and M2-phase VO2:Cr thin films. J. Appl. Phys. 111, (10), 104502 (2012). Remtema, T., Lin, L. Active frequency tuning for micro resonators by localized thermal stressing effects. Sens. Actuators A, Phys. 91, (3), 326-332 (2001). Göktaş, H., Zaghloul, M. The Implementation of Low Power and Wide Tuning Range MEMS filters for Communication Applications. Radio Sci. 51, (10), 1636-1644 (2016). Göktaş, H., Zaghloul, M. The Novel Microhotplate: A Design Featuring Ultra High Temperature, Ultra Low Thermal Stress, Low Power Consumption and Small Response Time. Sensor Comm. (2013). Kushmerick, J. G., et al. The influence of coating structure on micromachine stiction. Tribol Lett. 10, (1), (2001). Kim, J. M., et al. Continuous anti-stiction coatings using self-assembled monolayers for gold microstructures. J. Micromech. Microeng. 12, (5), 688-695 (2002). Bhattacharya, E., et al. Effect of porous silicon formation on stiction in surface micromachined MEMS structures. Phys. Stat. Sol. (A). 202, (8), 1482-1486 (2005). 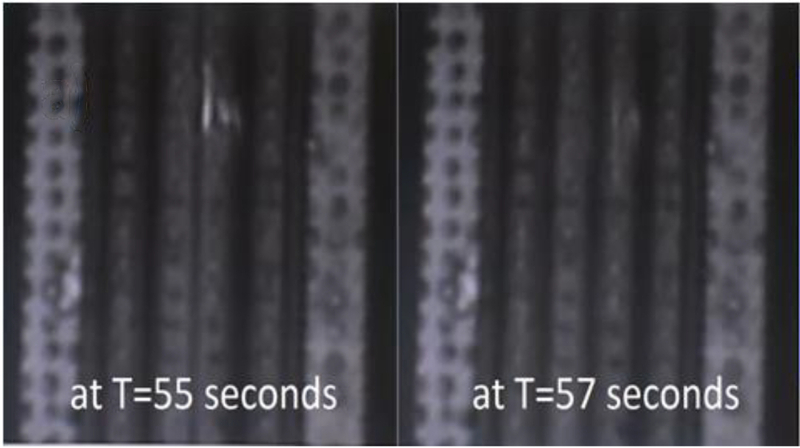 Koppaka, S. B., Phinney, L. M. Release Processing Effects on Laser Repair of Stiction-Failed Microcantilevers. J. Microelectromech. Syst. 14, (2), 410-418 (2005). Ghatkesar, M. K., et al. Higher modes of vibration increase mass sensitivity in nanomechanical microcantilevers. Nanotechnology. 18, (44), 445502 (2007). Göktaş, H., Mona, Z. High Sensitivity CMOS Portable Biosensor with Flexible Microfluidic Integration. IEEE SENSORS. (2013). Posted by: Onur Samet Y.